The enthalpy is a thermodynamic measurement of the energy of the reaction. Simply put, potential energy is present in the chemical bonds and quantification of this energy existing within molecules, is termed as enthalpy. The three types of measurements are enthalpy of formation, sublimation and reaction. In enthalpy of reaction, the bond between atoms undergoes the steps of breaking and, reformation either by absorbing or releasing energy which leads to a significant change in potential energy of the system. The energy in the form heat released or absorbed under constant pressure is termed as enthalpy and the difference results in the enthalpy of reaction. The state of reaction scheme as either endothermic or exothermic can be identified with the value of enthalpy. If the value is negative, it results in exothermic process by emitting heat to the surroundings while in positive enthalpy, energy flows from surroundings to the system. The enthalpy is influenced by bond enthalpy (bond-dissociation enthalpy or bond strength or average bond energy) and is expressed as kJ/mol (or) kcal/mol. The schematic representation of the reaction scheme are shown below. The steps for calculating enthalpy of a reaction are as listed below. The identification of the reactant having a chance of bond breaking and its bond enthalpies are noted in the initial step. The enthalpy values of the reactants with bond breaking, are added. Product enthalpies are represented in negative value for determining the amount of energy released. The product bond enthalpy values are added up. The difference of step 2 and step 4 yields the enthalpy of reaction value. The mathematical expression of the enthalpy of reaction is expressed below. The computation of energy as a state of function is termed as Hess Law and in other words the upgraded or improved version of enthalpy of reaction is Hess cycle where the energy of the intermediate molecular formation also been included in the computation of the energy for the precise enthalpy calculation. 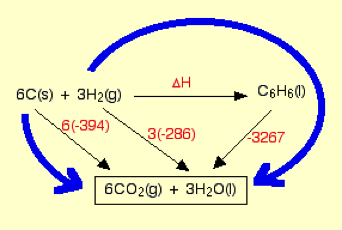 The Hess cycle is schematically represented below for quick visual grasping. The Hess law is quoted as “The enthalpy change accompanying a chemical change is independent of the route by which the chemical change occurs”. The three points must be remembered while writing Hess law cycle. For pre-determined enthalpy computation, the change in enthalpy must be represented horizontally by writing over it. In the same reaction scheme the route 2 is made with intermediate for completing Hess law cycle by writing the known enthalpy over it. 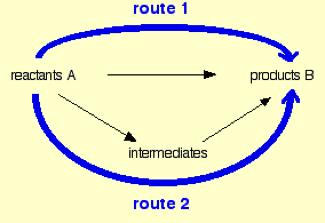 Finally, the appropriate route is selected based on the represented data and the schematic figure is shown below. Enthalpy of a reaction is the difference in bond enthalpies of product and reactants. Enthalpy is a form of potential energy. Hess Law is a precise way of calculating enthalpies since it includes all the intermediates. The amount of heat required to raise the temperature by one degree is specific heat capacity which is wide-ranging for different substances. For water its 4.184 Joule per gram of degree. There are two types of calorimetry namely bomb calorimetry and ice calorimetry, the measurement of heat flow using temperature change are performed using bomb calorimetry and in terms of other physical changes are performed using ice calorimetry. Let’s look at one example for easy grasping of the calorimetry concept. Example: 50 ml of 0.10 M HCl is mixed with same quantity of NaOH at 295 K in a small cup. As the reaction is exothermic, the generated heat raises the temperature to 301.9 K. Calculate the heat produced in Joules. The reaction is exothermic as the heat source value is negative which means the heat flows from the system to the surroundings, the reactant NaOH had favoured exothermic reaction as it’s hygroscopic by nature. During the advancement in the thermodynamics, study of the chemical reaction were all started from calorimetry – the traditional tool which paved a way in technological innovation of advanced calorimetry in the determination of the nature of the reaction by portable tools. The vast amount of reaction data which had been collected using calorimetry are used in the development of simulation software for quick and precise prediction with minimal or negligible amount of errors. Calorimetry is the tool for computation of exchanged heat energy among chemical reactions. The measurement of heat flow using temperature change are performed using bomb calorimetry. Measurement of physical changes are performed using ice calorimetry.